Finally, I got the time and painted this small painting yesterday and posted it on eBay. Thank you so many friends giving me support after my previous post. I restarted my learning. I am continuing working on leaves. I will work on this topic for a while until I feel I obtain the effect I really want. I have some ideas about leaves, but not much. My investigation will go deeper. I decided to go high key this time. My colors will show better this way. I believe low key showing light, and high key showing color. Don't you agree? I have not been posting anything on the blog for a long week. I have not put any paintings for sale on eBay for more than a month. Wow! what is going on? I even have zero activities in these two most fundamental fields of a daily painter. I have been painting less and less now. I must do many "more important" things. I hear the saying: when something goes up, it must come down. I hope it does not apply to my art. But I feel I am gradually losing the battle. Because I paint, so I have no time to paint. This is so ironic, but it is true. I think that is the teaching of Taoism: the value of non-action. Well, let us forget about all of those philosophical junk, and come back to art. I did this portrait last night. It is kind of interesting. After my previous post, a few artist friends sent me photos of my 3rd demo at the Coppini. I really appreciate their help to make this posting possible. "Demo at San Antonio 2"
This is my second demo at Coppini. I selected a square shaped object to demonstrate how to manage the perspective and measurement. I felt good about those flowers and leaves. I also did the third demo in front of both the workshop artists and general members of Coppini Academy. The studio was so professionally built with large north light windows. I saw way much more colors on my setup than I use to. It was overwhelming. I did OK. The third demo painting was sold at the spot. I did not get a chance to take a photo of it. If you were at Coppini watching my demo and having a photo, would you mind send a copy to me? Thanks. I am in San Antonio teaching a 3-day workshop at the Coppini Academy of Fine Arts. This is my demo painting I did today. I want to thank Gladys, W. C., and Eric for working so hard to make the workshop location available. I am so happy to meet many new friends. I hope all workshop artists have enjoyed today. There are more to come tomorrow. After I posted the question about the flexible palette knives, quite a few friends recommended Holbein Painting Knives. I think I am going to start from this one. Thank you so much for helping me out. To paint or to take a defensive driving class, that is the question. I was the bad guy, I was told driving 49 miles per hour on Hwy 290 went into Johnson City. Were I guilty for speeding, I do not have the time to argue. I paid what the police wanted and agreed to take the class to keep my record clean. Life is very short, let us paint as much as possible. 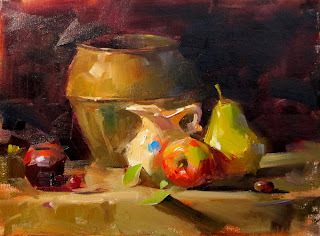 Now I want to learn the Richard Schmid approach seriously. I did this one last night, but I was very very tired. So I could not finish. Maybe I should have taken the defensive class instead. BTW, can someone tell me where I can get very flexible palette knifes? Thanks a lot. I was at Dallas yesterday attending the annual Plein Air Southwest Show organized by the Outdoor Painters Society. This was my first time in the show. The event had two activities: quick draw at the Dallas Arboretum and plein air painting exhibition at the Southwest Gallery. This painting is my quick draw piece. Since plein air landscape is deviated so much from my still life painting, I felt out of control. Many effects that I wish I could make happen did not. I have run into many areas that I have been completely lost. It was a beautiful Saturday morning. There were so many people in the park. I was put at the spot. Since I didn't know what I was doing, I just let my intuition take over. I pretend to be cool. Oh boy! I was a true con artist that morning. Finally, I think the painting turned out better than I thought. I was in Fredericksburg yesterday and did this demo for Die Kunstler Art Club. I hope you like it. I am going to teach a 3-day workshop at the Coppini Academy of Fine Art on April 15 -17. We still have one opening left. If you are interested in attending please contact Coppini Workshops. I have announced our 3-man show yesterday. However, the link does not work again. If you want to see the video, please click the new link. or search "3painters3vision" at the Youtube site. I am in Dallas right now. Tomorrow I will attend the Plein Air Southwest Show with the Outdoor Painters Society. Oh! boy. What a busy schedule. Yesterday I posted a link to a video. I am sorry it is not working anymore. Rusty has placed a new one on Youtube. "3 Painters 3 Visions" is the 3-man show of Rusty Jones, Bob Rohm, and me at the Riverbend Fine Art Gallery in Marble Falls, TX. The reception will at 6:00 PM to 8:30 PM on Saturday, April 30, 2011. We will do painting demos before the reception, please contact Riverbend Fine Art Gallery for detailed information. I hope to see you at this event. We have some roses blooming so beautifully in the back yard. Song cut some and arranged them in a wine glass. In this painting I experimented quite a bit. It is not my usual dark background low key approach, and it is not high key either. I painted these roses like the way I painted portraits. I left large area in the background the toned canvas. I don’t consider this experiment a successful one. I don’t have my spot light effect, and my grays are not clean. I wanted the leaves showing more, but it didn’t happen. Anyway it is another painting day. Tomorrow will be a new day. Our 3-man show is coming up on April 29. Rusty Jones, Bob Rohm, and I will show our paintings at Riverbend Fine Art Gallery at Marble Falls, TX. Rusty made a wonderful Youtube video to promote the show. Please click here to see it. This is a relatively large painting. I like that white blue pot. I got it from an antique store. I am not sure what it was for. Was it a soup container? Can someone tell me? It looks very old, and it makes a very good still life object. I like to paint old stuff. I know many (if it is not all) artists do. I am not very sure why the old stuff is better. Is it because old objects show effect of time or the timelessness. We are often nostalgic for our earlier lifes. Is it because our currently time so tasteless so we are long for the good old days. Anyway, the old stuff looks better to me. You see more of my portraits recently. It feels that my dominant genre (still life) starts change. Well, it is not the case. My real motivation is that I am preparing for my friend Zhaoming Wu's workshop in May. This is my first time to organize a figurative workshop. I need to have a list of models available. I believe that the best way to identify good models is to paint them. Hiring models is not easy. I have shared with you 6 portraits so far. However in 3 painting sessions, the models didn't show up. The rate of model absence is 50%. That makes me nervous. I don't want to see this kind of thing happen on the workshop. So if you are experienced in organizing life drawing and painting activities, I would like to know your suggestions. Ellen is an artist friend of mine. She and I went to a life painting yesterday, but the model didn't come. Ellen volunteered to model for everybody. I really appreciate she did that. For this painting, I didn't do a good job. I didn't get the likeness and my perspective had many problems. Well, I know I have a long way in front of me if I really want to be portrait painter. I am prepared.